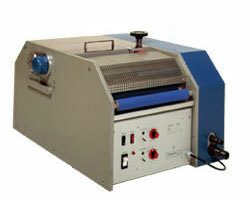 A professional unit that integrates all important steps of PCB wet processing. This high performance multilayer press was designed for PCB labs to enable quick prototyping of multilayer PCBs of up to 6 or 8 layers according to industry standards. A compact and floor standing aluminium rack contains all parts of the unit including pressure supply, press plates and heaters.